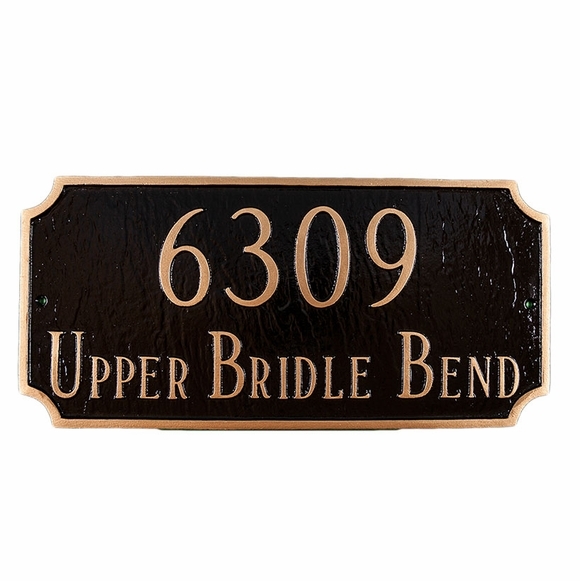 Personalized 2 Line Rectangle Address Plaque - - holds one line or two lines of personalization. Modified rectangle features semi-circle cut-out corners. Available in Standard size and oversized Estate size. Made in USA. Standard sign is 15.75" wide x 7.25" high. Holds up to five numbers on line 1 and up to 17 characters on optional line 2. If you order a 1 line standard sign, characters are 4" high. If you order a 2 line standard sign, the characters on line 1 are only 3" high. Estate sign is 27" wide x 14.25" high. Holds up to five characters on line 1 and up to seventeen 2" letters on optional line 2. ** If you order a 1 line estate sign, characters are 8" high. If you order a 2 line standard sign, the characters on line 1 are only 5" high. If you are not using line 2, leave input box blank. Solid cast aluminum. Characters and border are part of the sign, not added on. Made in the USA. Could not ask more of the porduct we received. It is the perfect size and the Gold on Black really stands out. Put it up yesterday and we're already receiving compliiments from the neighbors. Highly recomend this product. After 17 years our original ceramic house number plaque crumbled from weathering. It was time to upgrade and am I glad we did. Our new address plaque looks great on the mailbox at the end of the driveway. It's easy to read and will last at least as long as I do. Love it!